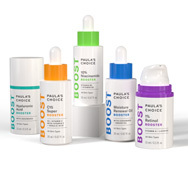 Skincare boosters are specialized products that contain a high concentration of a single type of ingredient, such as vitamin C or, for example, a blend of non-fragrant plant oils, along with supporting ingredients that enable the main ingredient(s) to be even more effective. Adding one or more boosters to your routine allows you to customize your skincare routine and get visible results you'll find impressive. How to: After cleansing, toning, and exfoliating, apply 3-5 drops of C15 Super Booster to entire face, adding a bit more if needed. Next, apply a pea-sized amount of 10% Azelaic Acid Booster where needed. Follow with your serum, moisturizer, and eye cream. How to: After cleansing, toning, and exfoliating, dispense 2-3 drops of the Retinol Booster into the palm of your hand. Next, add a pearl-sized amount of Peptide Booster. Mix the two with your fingertips and apply to your face and neck. Follow with your serum, moisturizer, and eye cream. How to: After cleansing, toning, and exfoliating, dispense 2–3 drops of the Retinol Booster into the palm of your hand. Next, add 3–5 drops of the C15 Booster. Mix the two with your fingertips and apply to your face and neck. Follow with your serum, moisturizer, and eye cream. How to: After cleansing, toning, and exfoliating, dispense 3–5 drops of the Hyaluronic Acid Booster and apply to your face and neck. Dispense a pearl-sized amount of the C25 Super Booster and spot-apply to discolorations. Add some spice: Dispense 3–4 drops of the Niacinamide Booster and apply to face and neck after the Hyaluronic Acid Booster. Niacinamide helps strengthen skin against moisture loss and further improves the appearance of discolorations and uneven skin tone. How to: After cleansing, toning, and exfoliating, dispense 2–3 drops of the Niacinamide Booster and smooth over your face and neck. Follow with 2–3 drops of the Oil Booster, applied to dry areas, including around the eyes. You can also mix the Oil Booster with your facial moisturizer and apply this blend to face and neck. Optional: Add a bit more C25 Super Booster (try mixing it with your nighttime moisturizer) for larger areas of blemishes or uneven skin tone.